Posted August 29, 2016 by The Rapid & filed under News. 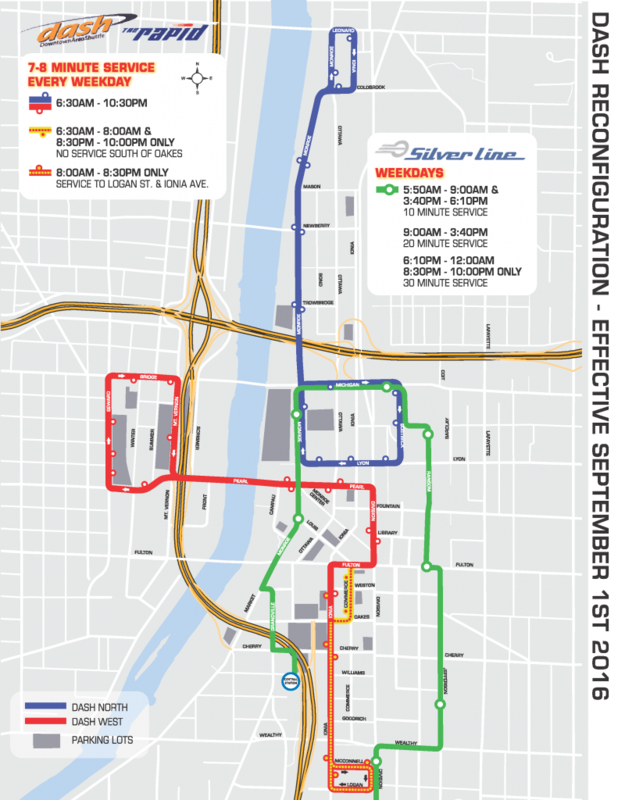 On Thursday, September 1, 2016, the City of Grand Rapids’ Mobile GR & Parking Department will make improvements to ensure easier travel throughout Downtown. 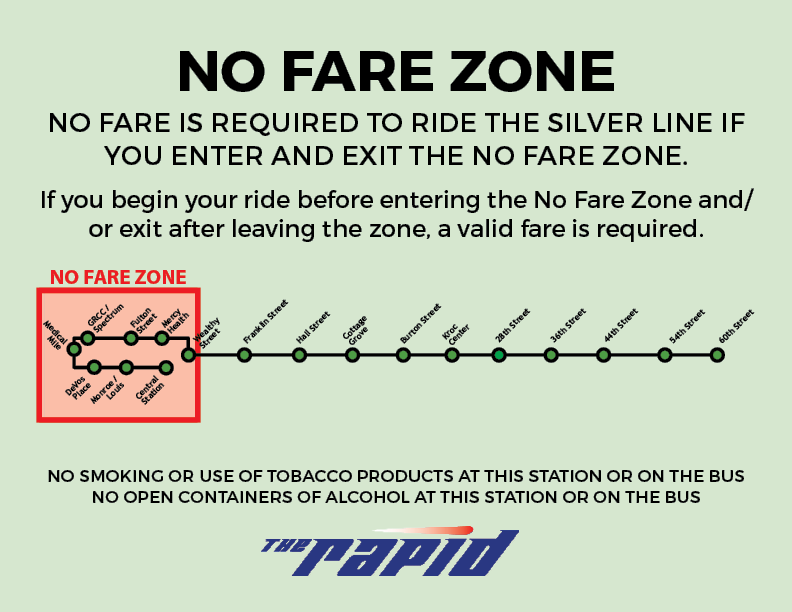 There will be major modifications to the City’s no-fare DASH shuttle service and the start of the Silver Line’s No Fare Zone, encompassing Silver Line Stations from Rapid Central Station to Wealthy Street Station. “In order to best serve the current and future needs of Grand Rapids residents, businesses and visitors, our Parking Services Department must evolve to meet existing and projected transportation demands,” said Joshua Naramore, Mobile GR & parking manager. “Overall, our plan is to improve automobile traffic, while integrating the goals of the City to improve conditions for pedestrians, bicycles and transit,” Naramore said. We’ve teamed up with the City of Grand Rapids, Mobile GR & Parking Department, The Rapid and Downtown Grand Rapids Inc. (DRGI) to establish a “Park Once” district in Downtown. The “Park Once” district will allow drivers to park once and travel throughout Downtown via free public transportation. The City is increasing DASH service to create a true high-frequency Downtown DASH Circulator – a de facto Downtown Area shuttle – that complements the current fixed-route public transportation network. The no-fare service will run on weekdays, with exceptions on holidays. The City is consolidating service lines from the existing four DASH routes to two new routes – DASH West and DASH North – that are both within easy walking distance of all City-owned parking facilities. 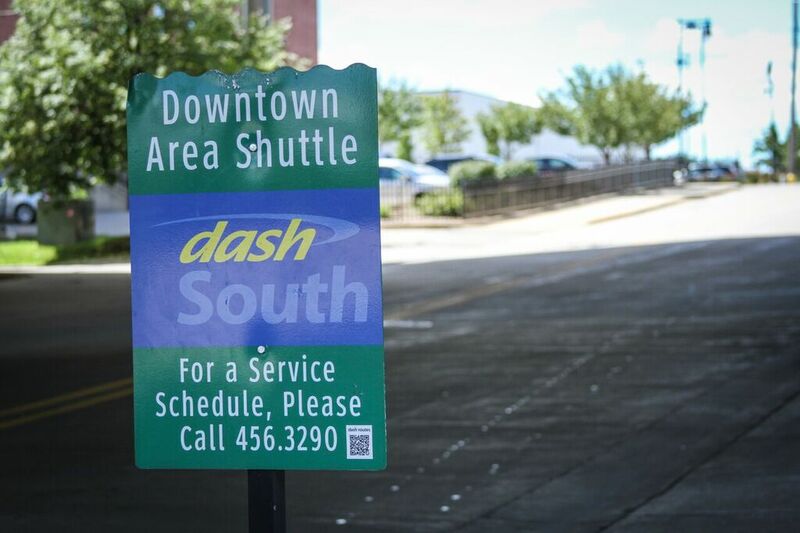 Beginning Thursday, Sept. 1, DASH service operation hours will increase to run from 6:30 a.m. to 10 p.m. during the week, with frequency of 7- to 8-minute service all day long. A fleet of seven DASH buses will operate at all times to connect current City parking facilities to Downtown destinations, as well as to link all major destinations through a simple pair of routes connecting Downtown and surrounding neighborhoods. Another highlight that begins Thursday, Sept. 1, will allow Downtown travelers to ride the Silver Line at no cost, all day long, from north of Wealthy Street and throughout Downtown within the No Fare Zone. The new pilot project is a partnership between the City, Downtown Grand Rapids Inc. and The Rapid. As Grand Rapids has experienced growth and development, the number of visitors and residents traveling to and from the central business district has increased accordingly, straining the existing parking supply and creating congestion within the downtown core. The rate changes are aimed at helping to resolve these issues and address future parking needs.